Danai Gurira, who rocketed to fame after joining AMC's zombie series in season 3 as the steely badass Michonne, will be departing the show after the tenth season. Her appearances will be limited to only a few episodes, according to The Hollywood Reporter. Originally introduced as a brooding warrior with a dark past distrustful of Rick Grimes' band of survivors, the character of Michonne only grew in complexity in later seasons. After forming a bond with Rick's son Carl, she eventually became a romantic interest for Rick himself; as the character's popularity grew, Gurira's stock as an actress exploded. She channeled a bit of Michonne's badass vibe for her standout role as Dora Milaje general Okoye in last year's smash hit Black Panther, a role she reprised in Avengers: Infinity War; she's expected to do so again the upcoming Avengers: Endgame, and she's also in talks to appear in 2020's Godzilla vs. Kong and the as-yet untitled Star Trek 4. As if all of these big-budget productions knocking down her door weren't enough of a demand on her time, Gurira is also continuing to build her career as a playwright. She won a Whiting Award for her 2012 play The Convert, which recently enjoyed a lengthy run in London with Black Panther co-star Letitia Wright starring; she also garnered a Tony nomination in 2016 for Eclipsed, which starred Lupita Nyong'O (those women of Black Panther really seem to enjoy working together). In addition to her stage work, she's also currently developing a miniseries based on Nigerian author Chimamanda Ngozi Adichie's novel Americanah, which she will produce along with Nyong'O, who is set to star. 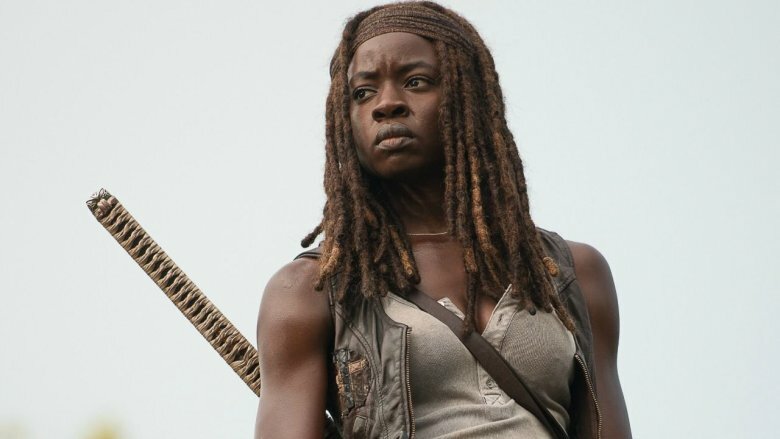 With all of this going on, it's not exactly a shock that Gurira would have little time left for The Walking Dead, but the news of her departure constitutes a significant blow to the long-running series. It comes just months after the show aired its final episode featuring Andrew Lincoln's Rick Grimes, and longtime stars Lauren Cohan (Maggie), Xander Berkeley (Gregory), and Tom Payne (Jesus) have also recently exited. There remains the strong possibility, however, that Michonne could make a return for one or more of the three planned spin-off films starring Lincoln which AMC currently has in the works. Speaking to THR last November, AMC's president of original programming David Madden recognized Gurira's contribution to The Walking Dead's continued success. "She has been very vocal about saying that she loves the show. We love Danai; we love that character," he said. "Right now, she's got a lot of opportunities and she needs to weigh what she feels is best for her. But we certainly would want her on the show as long as she wants to be on it… She is an incredibly valuable character and I'm really hoping she stays… The goal is to have Danai continue on whatever basis she can make work, given the other things that she has going on in her life." With regards to the first Rick-centric spin-off movie, Madden had this to say: "I can't really say to you what will exactly happen in the movie, but… let me put it this way: I have high hopes that Rick and Michonne's paths will cross again. I'll just say that." Gurira's presence would certainly serve to bolster fans' interest in the spin-offs, the first of which is currently in production. Her departure from the main series will essentially result in Carol (Melissa McBride) being promoted to lead character status, much as Lincoln's exit did for fan favorite Daryl (Norman Reedus). Both McBride and Reedus recently signed multiple-year franchise deals with AMC, indicating that the pair will likely be holding down The Walking Dead through the tenth season and perhaps beyond; their deals also include the possibility of their characters being ported over to a spin-off series or film. All told, it's another sad day for TWD fans, with Michonne's likely reappearance at some point down the road offering a bit of a silver lining. The series' ratings have been steadily falling for quite some time now, and no matter how awesome Daryl and Carol are (and they are), a rebound seems improbable so long as the mass exodus of popular characters continues. On the plus side, the limited runtime of the spin-off features could introduce a much-needed leaner, meaner narrative style to the world of The Walking Dead, potentially reigniting the interest of fans fed up with the series' tendency to meander; throw in a Rick and Michonne reunion, and AMC just might get a good portion of the show's severely depleted, once-formidable fan base back on board. We'll be here to report any and all details on the spin-offs as they become available.